Former South Carolina governor and U.S. senator Ernest “Fritz” Hollings died on Saturday, April 6th, at the age of 97. The Charleston, S.C. native – whose chiseled features, gentrified drawl and razor sharp wit endeared him to Republicans and Democrats alike – was a dying breed long before he passed away at his home at Isle of Palms, S.C. In fact he used to refer to himself as “the last of the Mohicans,” referring to the gradual extinction of white Democrats in the south. A definitional “old school” Democrat, the man credited with creating the Palmetto State’s technical college system was also responsible for raising teacher salaries in South Carolina to the regional average. ​Hollings was the first of several “education governors” in South Carolina – followed in that vein by fellow Democrats Richard Riley of Greenville and Jim Hodges of Lancaster. “In our complex society, education is the cornerstone upon which economic development must be built – and prosperity assured,” he said during his tenure in office. Anyway, we can have that debate tomorrow … today is about remembering Hollings, a graduate of The Citadel who in fairness was probably more fiscally conservative than most modern-day Republicans. After serving as an artillery officer during World War II, Hollings was elected to the S.C. House of Representatives in 1948. He became lieutenant governor of South Carolina in 1955 and governor in 1959. 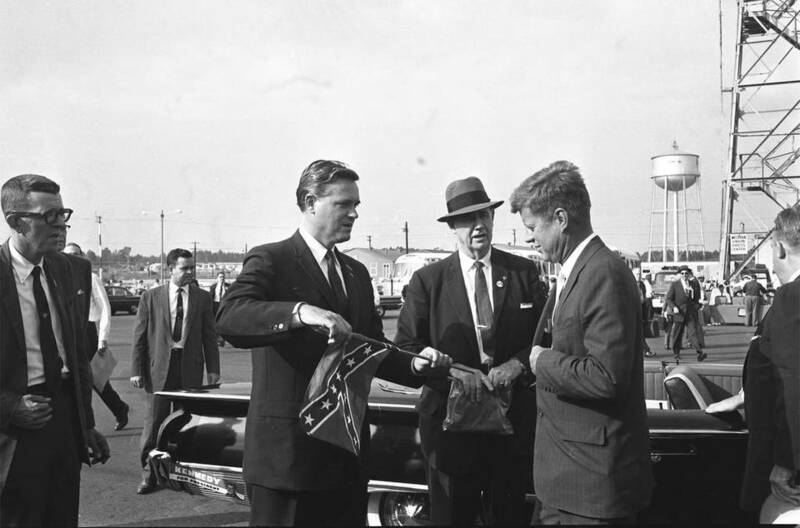 It was during his tenure as governor – on April 11, 1961 – that the Confederate flag was first raised from the dome of the S.C. State House. ​In 1966, Hollings was elected to the U.S. Senate – where he remained until 2005. He and the late U.S. senator Strom Thurmond were in office alongside each other for 36 years – a record for a duo from the same state. Along the way, Hollings was challenged by current S.C. governor Henry McMaster – whom he thrashed by a 63-35 percent margin during the 1986 election. The key moment of that campaign? During a debate between the two candidates, McMaster challenged Hollings to submit to a drug test. “I’ll take a drug test when you take an IQ test,” Hollings fired back at McMaster, a reference to the latter’s legendary intellectual incuriosity. No Democrat has won a U.S. Senate race in South Carolina since that election. ​Hollings ran for president once during his lengthy political career – in 1984 – but failed to draw even one percent of the vote in Iowa and finished with only four percent of the vote in New Hampshire. Our view on Hollings? While his state-level policies never produced the prosperity he promised (something current leaders ought to take note of), he was not a total wash during his tenure in the U.S. Senate. To his credit, Hollings was probably the last Democrat in Washington, D.C. to try and rein in deficit spending – which has exploded since he stepped down in January of 2005. Hollings was also a staunch opponent of unfair trade deals long before U.S. president Donald Trump made this issue a cornerstone of his candidacy (and a key component of his success with Democratic Rust Belt voters). “The same place you bought your wig, Sam,” Hollings shot back. Hollings’ blunt, unfiltered approach to politics often got him into trouble (like the time he referred to Jewish U.S. senator Howard Metzenbaum on the floor of the Senate as “the senator from B’nai B’rith”). Still, his edgy rejoinders were far more honest and endearing than the politically correct drivel we get from our contemporary crop of politicians. Speaking of endearing, in an age in which politicians clamor to have buildings, roads and other monuments named after them – Hollings actually pushed to have his name taken off of a federal courthouse in his home town of Charleston so that the honor could go to someone he felt was more deserving of it. Whatever we thought of Hollings, though, we encourage all of our readers to keep his friends and family in their prayers today upon the occasion of his passing. UPDATE: Hollings’ body will lie in repose at the S.C. State House between 10:00 a.m. and 5:00 p.m. EDT on Monday, April 15, 2019. His funeral will be held at 11:00 a.m. EDT on Tuesday, April 16, 2019 at Summerall Chapel on the campus of his alma mater. Note: This article previously appeared on FitsNews.com on April 6th, 2019.